Or Bondaweb as it is called in some places. This is a medium weight webbing, the heavier stuff prints well also - note I'm using my cheap Epson CS86 to do this with, not an expensive inkjet printer. You can also print directly onto regular, non fusible, interfacing as well. 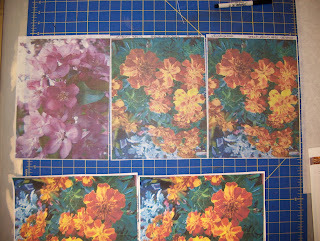 the bottom images are on papers, the top prints are on various types of interfacings and webbings. These are from several years ago, according the file info, it's been awhile since I've done any transfers. I did take notes, so will have to consult them now, but I don't remember having any backing on the fusible webbing as went through the printer.